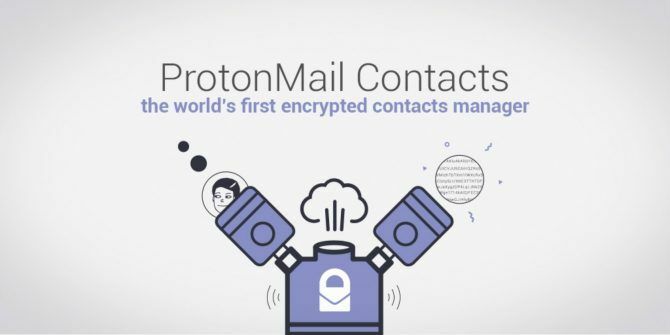 ProtonMail has launched a new contacts manager for its encrypted email service. And just like its email service, ProtonMail Contacts offers enviable levels of encryption. This makes it perfect for anyone who believes Big Brother is watching their every move. Which is 1984-level stuff. In these troubled times, with governments spying on their citizens Your Interest in Privacy Will Ensure You're Targeted by the NSA Your Interest in Privacy Will Ensure You're Targeted by the NSA Yes, that's right. If you care about privacy, you may be added to a list. Read More , encryption is more important than ever. ProtonMail already offers an encrypted email service for people keen to keep their communications private, and it has now added an encrypted contacts manager to its offerings. ProtonMail Contacts, which ProtonMail is describing as “the world’s first encrypted contacts manager,” now offers “zero access encryption and digital signature verification”. This means that nobody other than you, including ProtonMail itself, should be able to see your email contacts. Zero-access encryption means only you can see the protected contact fields. And digital signature verification means nobody has tampered with your contacts. Everything can be encrypted in this way except for email addresses, which ProtonMail needs to actually send emails on your behalf. The new ProtonMail Contacts is only currently available on the web, but should be available on Android and on iOS soon. In the meantime, in the blog post announcing its new encrypted contacts manager, ProtonMail explains how ProtonMail Contacts works. Essentially, ProtonMail generates a new public and private key pairing for every email account. The private key is generated on the client side “using a derivative of your password which we don’t have access to,” keeping ProtonMail out. Contact fields are then encrypted with the public key, and can only be decrypted by the private key that only you know. All encrypted data is also signed with your private key, allowing its authenticity to be verified every time you access it. While ProtonMail is open to everyone, it’s especially important for journalists. The press is a powerful force for good, and with the news media under attack Top 5 Unbiased World News Websites Free From Censorship Top 5 Unbiased World News Websites Free From Censorship Is there no place for the reader to turn for unbiased news? These popular news websites are free from censorship. Read More , encrypted communications are increasingly important. Which makes ProtonMail Contacts a precious commodity. Do you currently use ProtonMail? If so, why? Are you a journalist looking to glean important information from sources? Or just an ordinary citizen paranoid about their privacy? Will you be using ProtonMail Contacts? Please let us know in the comments below! Explore more about: Contact Management, Encryption. Only real and active followers are helpful to increase Instagram account and promote your brand and products. Get real followers and likes from GetInstaFollow is a good choice. How is it the 'world's first encrypted contact messenger'? Posteo's and Tutanota's contacts have been end-to-end encrypted since years.